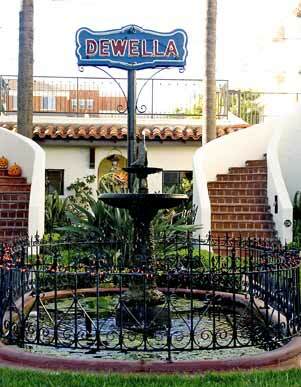 Lushly landscaped and well-designed, the Dewella Apartments, located at 234-236 East Wilshire Avenue , were constructed for $11,000 in the historic central core of Fullerton , California , in 1929. The Dewella is the only apartment or garden court apartment in the City of Fullerton . 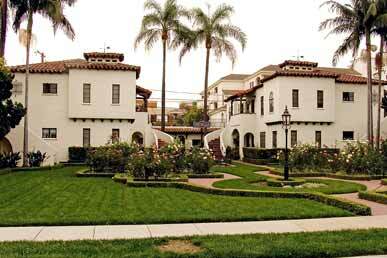 The complex is also the only time that the Spanish Colonial Revival style was applied to an apartment building in Fullerton . The Dewella's superb use of Spanish Colonial Revival architectural details—railings, gates, locksets for doors, weathervanes, lighting fixtures, decorative grills, etc.—provide a unifying theme for the complex, while also providing a counterpoint to the complex's large areas of white stucco. One of the oldest apartment buildings in the city, the Dewella consists of eight five-room units arranged around a central courtyard that features an oval-shaped fountain. Two identical wings, extending north and south, are linked at the rear southern end of the lot by a one-story structure used for utility, storage, and garage space. The use of the two-story structures on the sides and a single-story structure at the rear is an unusual reversal of the bungalow court, the preferred multi-family dwelling in Fullerton prior to World War II. The Dewella Apartments are unique for their graceful combination of building and landscape, which features sweeping staircases, symmetrically designed apartment wings, and formal layout of the garden area in front. The exterior features white stucco walls, red tile roofs, clay tiles, decorative iron work, balconies, and other Spanish style elements. The Spanish Colonial Revival architecture integrates Mission-style turrets and Monterey-style balconies, a combination that is unique to Fullerton . Laid out in a symmetrical pattern, the Dewella's landscape and landscape elements (benches, fountain, pathways) are carefully integrated into the apartment complex's architectural design, enhancing its picturesque Spanish Revival ambience. The apartment court also features the oldest neon sign in Fullerton , only one of two that still remain within the original townsite. The apartments' identical interiors feature gas fireplaces, oak wood floors, built-in china and linen cabinets, coved living room ceilings, and hallway telephone stations. The Dewella Apartments were constructed in 1929 by Herman Henry (1874-1966) and Edna H. Bruns (1888-1975) of Anaheim (1420 S. Los Angeles , razed). Herman Bruns, an engineer with the Southern Pacific Railroad, had moved out to Orange County from the Midwest around 1910. While Mr. and Mrs. Bruns lived in Anaheim , they had relatives, including Mrs. Bruns's father, living in Fullerton . The couple built the Dewella Apartments as a business investment. From 1910 to 1940, Fullerton had a serious "housing accommodation" problem and a "high demand for good rental property," and the city was seen as an ideal location for attracting renters. When completed, the Dewella Apartments cost Mr. and Mrs. Bruns $35,000: $11,000 for the complex and $24,000 for four lots. Mrs. Bruns spent an additional $1400 on furniture and other furnishings purchased from the Clausen Furniture Company in Santa Ana . All the units had matching furniture and rugs. The Apartments were named for Dewella Bruns Seaburg (1898-1921), the daughter of Herman Bruns and his first wife Edna Emma Quelle Bruns (1878-1942). Dewella Seaburg had passed away during childbirth eight years before the Apartments were built. Because the apartment complex was to be named for Dewella Seaburg, the Bruns Family wanted the property to be special. To ensure that his daughter's name would remain on the Dewella, Herman Bruns placed a deed restriction on the Apartments that required the neon sign to always remain on the property. While Mr. Bruns provided construction funds for the Dewella Apartments, the project really belonged to Mrs. Bruns. She selected and worked with the building's designer/contractor Ora Vinton Noble, contacted the local press, decorated each of the units, and even sewed the draperies that hung in the windows of each apartment. The Dewella opened for public viewing and inspection on Sunday December 15, 1929, from 2:00 to 8:00 p.m., and the furnished eight five-room units were completely rented out in twenty-four hours. The Fullerton News Tribunefeatured the Apartments in a full-page spread and called the Dewella "One of the most artistic apartment houses in Orange County , yes, in Southern California ." The Apartment were described as having all modern conveniences, including "General Electric refrigerators, electric stoves, electric and gas heat, built-in cabinets and service porches." The furnished apartments were advertised as excellent accommodations for families with small children, not singles, but soon became a popular place for young married couples. 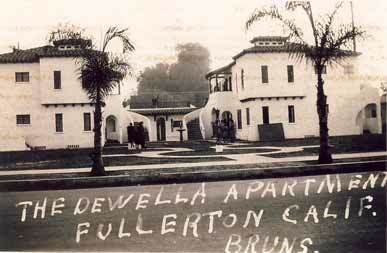 Mrs. Bruns had made plans to erect two more identical units north along Wilshire Avenue, making the apartment complex the largest in Fullerton, but the Dewella unfortunately opened almost two months after Black Thursday, October 24, 1929, the day of the stock market crash, and construction of the additional wings was abandoned. The Bruns family held on to the Dewella Apartments until July 8, 1947, when they were sold to Mabel (1890-1982) and John Neuschafer (1889-1968), who resided in Apartment #1. The Dewella Apartments were designed and built by general contractor Ora Vinton Noble (1882-1942), who, in turn, subcontracted out some of the work to local contractors. 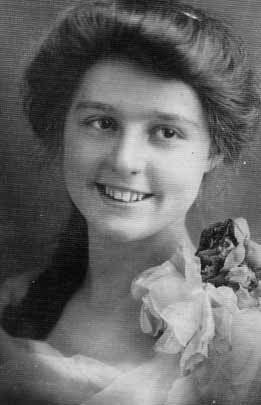 Noble was born in Albia , Iowa , on May 4, 1882, but moved to Santa Ana with family members around 1900. Throughout his lifetime, Noble held a number of jobs, but always fell back on his carpentry skills when the economy was bad. He was an automobile aficionado who would travel great distances to complete building projects at a time when roads were underdeveloped in the United States . He moved frequently, moving in and out of California , always using his residence as his business office. In 1908, Noble moved to Los Angeles ( 392 Budlong Ave. ) where he advertised himself as a carpenter, but by 1913, he had advanced to general contractor, making enough money to construct a seven-room Craftsman bungalow for himself at 1139 West 39 th Place . Around 1914, Noble married Agnes Augusta McNeal (1884-1960), a member of the wealthy pioneer McNeal and Ross families, in Los Angeles . Agnes McNeal's grandfather was Jacob R. Ross, Sr. (1813-1870), the original owner of the property on which the City Santa Ana now stands. The couple moved back to Santa Ana and on June 20, 1914, Noble announced in the Southwest Contractor and Manufacturer that he had established himself as a contractor and builder at 1004 Baker Street , the home of his mother-in-law, Christiana McNeal (1853-1932). In December 1916, Noble and his wife drove their six-cylinder Overland Light Six touring car 1,750 miles to Fort Worth , Texas , where he constructed a residence and later headed the service/used car department of the Overland Automobile Company headquarters in Dallas . The couple returned to Los Angeles in September 1917, settling in Long Beach (1157 Walnut) where Noble worked as a shipwright for the Los Angeles Shipbuilding & Dry Dock Company (later Todd Shipyards) in San Pedro during World War I. After the War, the Nobles moved back to Santa Ana (312 E. 3 rd St., 1019 Van Ness, 1615 W. 1 st St.) where Noble constructed a Young Women's Christian Association hut at Santa Ana High School in 1921 for $7337. 19 By the time of the Dewella Apartments' construction, Noble was back living in Long Beach (1145 Cherry Ave.), advertising himself as a "Contractor—Designer—Builder specializing in apartment house construction." 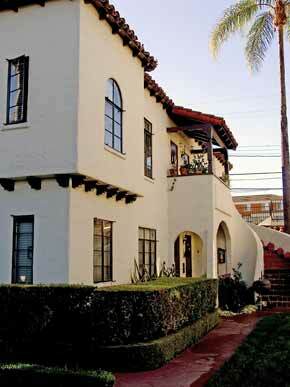 After completing the Dewella Apartments in 1929, Noble worked on a project in Santa Barbara, moved out of California, but returned in the mid-1930s to Los Angeles (2232 S. Catalina, 1712 Reynier Ave.) where he remained until his death. At the time of his death due to heart failure on October 30, 1942, Noble was a cabinet maker. Ora and Agnes Noble, who had no children, are buried in the Ross Family section of the Santa Ana Cemetery (1919 E. Santa Clara), the cemetery founded by Jacob R. Ross, Sr. in 1870.